This unique restaurant and bar on Cross Street isn’t afraid to experiment with different kinds of flavors of their main specialty: Sausages. They serve up everything from sweet Italian and vegetarian bratwursts to more exotic offerings like bison, catfish, and even alligator! The Wurst Bar might just be the most interesting bar in Ypsi! Their most popular offerings are their bratwursts, it’s in the name! They serve 12 brats, ranging from the “usual” brats like Sweet Italian, which is made with pork, beef, rosemary, and oregano; the Vegetarian Hot Seitan, a spicy brat with red pepper, paprika, and seitan; and the Braadwurst, which is made with pork, pepper, and nutmeg. Their “unusual” offerings include bison, lamb, Swiss merguez; cheddar summer sausage, which has beef, cheddar, garlic, coriander, and nutmeg; and gator and catfish brats, which are served with red pepper and green onions. All brats are served with a wide array of toppings like sauerkraut, caramelized onions, roasted sweet peppers, and pickled spicy peppers. Wursts aren’t the only thing that The Wurst Bar dishes up; they also have a great selection of burgers as well. The Original is, of course, the original, made with fresh ground brisket with lettuce, onions, and tomatoes. They also serve up the Wurst Burger, which has their famous wursts on an Original burger and includes onion, sauerkraut, tomato, and Swiss cheese. The Wurst Bar also has a good collection of smaller snacks if you aren’t in the mood for their main courses. My personal favorite are the poutine tots, which are tater tots served with brown gravy, and Wisconsin cheese done in the style of the classic Canadian poutine. The Wurst Bar has been serving up their unique style of bratwursts to the Ypsi community since 2012. Located at 705 Cross St. 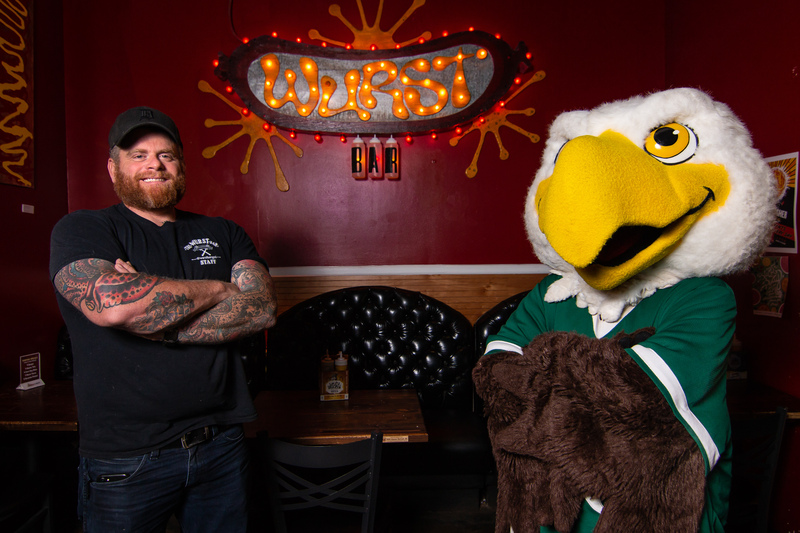 The Wurst Bar is literally right across the street from EMU’s campus. You can take an easy, quick walk to this place after a long day of exams and lectures. With unique dishes, a great atmosphere, and friendly staff, we are proud to promote The Wurst Bar as July’s Eagle Discount Program Business of the Month! Gary Simmons is a senior from Muskegon, Michigan who is majoring in both Journalism/Media Studies and Urban Planning. When he isn’t out promoting EMU/Ypsilanti with the Go Social! Team, he is either writing articles for the Eastern Echo, working on TV programs with EMU’s student-ran ETV station, or is making people laugh with Laugh-a-Minute Enterprises.